Katiebird, aka Katie, aka MACH2 Beartooth Mountain Sapphire CD MX MXJ AJP EAC EJC OCC TN-E WV-O BSCA Ag-HOF CGC was born on 8-23-98. Katie’s sire is Ch Johnsondale’s Folero UD ‘B’ SchH I WD-C TT CGC. Her dam was Ch Anduril’s Raven Celeste whose sire was Ch OTCh U-CD Czequet's Charfire Charon HT,TT, HOF WD-X Am SchH I CGC TDI. She comes from a great line of performance dogs and was a Montana girl too. But my story with Katie really started with Rosie back in 1995. My agility career started at the Idaho Humane Society where I found Rosie in 1995. I didn’t know about Belgians at the time and thought Rosie was a Border Collie mix. I was a volunteer adoption assistant and I helped people “pick out pooches” so they would have a high likelihood of having successful and rewarding matches. Rosie was about eight months old and when I saw her, she had already been dumped at the shelter twice. She was desperate to find a loving home. She was affectionate and beautiful, and I couldn’t get her out of my mind. I told myself that Rosie wouldn’t fit through my doggie doors, and she was fearful and overprotective. It took me three visits to finally decide to take her home. Well, Rosie did indeed fit through my doggie doors after all. And she still bears the emotional scars that leave her fearful of kids, especially those carrying sticks. But she tried very hard to please and grew even more beautiful and sweet by the day. Then in September 1997, I took Rosie to an Idaho Capital City Kennel Club match to watch the dogs compete. 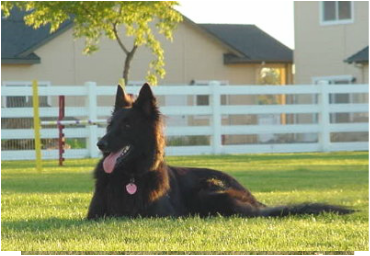 That is when I discovered that she was a purebred Belgian Sheepdog and that I could get limited privilege papers (ILP) from the American Kennel Club which would allow me to compete with her in performance events. For Christmas that year, we got her ILP and Third Hand Rose and I began training for obedience competition. 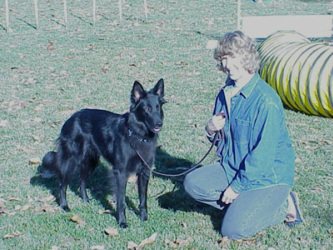 Rosie loved obedience training and we competed in our first show in April 1998 in Lewiston, Idaho. I actually pulled her from the first class thinking she might bite the judge because she had been showing off her teeth to people shortly before the show. The next day I mustered my courage and Rosie went in the ring and performed beautifully for the next three days. We won two firsts and a second at our first show! That is when I first met Tami Worley who inspired me to continue to develop my dog-training skills and show how great my dog could be. Then we were really fired up to go on to open obedience and we started training for that in May and competed in August and October, again taking two firsts and a second. We even scored high enough to be invited to compete in the Pupperoni Regionals which were held in various regions throughout the country. Ours was in Portland and we competed there in 1999. We were way over our heads in the Pupperoni competition but we had a great time. I am sure there weren’t too many $50 shelter dogs in the competition. In 1998, agility lessons and practices had begun in Boise and I found myself getting hooked on the thrill of running through obstacles with my partner. We practiced in the city parks on Saturday mornings and I took lessons one evening a week. Rosie is a smart girl so we were soon competing in Oregon, Utah, and Idaho. And I was invited to get involved with the Idaho Capital City Kennel Club’s agility committee and we put on our first agility trial that fall. But it didn’t take long to see that Rosie’s preference was obedience and not agility. She dutifully went through the courses with me but she didn’t have a fire in her belly for the sport. Or, maybe I didn’t know how to make it fun for her. In any case, she earned her novice and open standard and jumpers titles with few faults. By fall, I knew I wanted what I called a “performance bred” Belgian Sheepdog. But I was very naïve and knew not what I was asking for. Katiebird lay in wait, ready to let me know what a challenge a high drive dog could be to the unsuspecting. That fall, I got to know Jen McCandless through correspondence on Belg-L. She sold a puppy to someone in Boise and I agreed to help with information about Belgians and dog training. She also asked me if I might be interested in Katie, who went by the name of Phyre at that time. Katie was an intense pup and Jen was wanting her to go to a performance home. Well, I had a rescue Belgian here in addition to my two dogs so it wasn’t good timing for me. But I stayed in touch with Jen and continued to ask about Phyre almost weekly. Phyre went to live with Elaine Havens in Orange, California for about six weeks. In the meantime, I found a home for the rescue dog and when I asked the rescue coordinator about possible performance bred Belgians or breeders, she sent me to Cara Greger who sent me to Jen McCandless and Phyre! I couldn’t believe that the same puppy would be brought to my attention. So I felt it was fate and contacted Jen again, but this time I was serious about getting Phyre. So Katie arrived by plane at Thanksgiving in 1998 and my life changed forever. Before Katie, I had lived with three different dogs beginning in 1980. Only Rosie became a show dog. None of them had the passion and drive that Katie had so I had no idea what I was getting into! Katie had tremendous focus and threw herself into whatever she was doing. I was totally unprepared for this “performance bred” Belgian. While she was very trainable, she also had a lot of prey drive and was very focused on chasing anything, especially other dogs. I had to learn fast how to deal with all of her drive, and I wasn’t always successful. But my skills improved thanks to Katiebird. I started training her for agility when she was six months old and since we trained in unfenced parks, she was never off leash. We could only master three obstacles at a time because I couldn’t keep up with her and I didn’t want to slow her down by restraining her with the leash. I trained for rock solid stops on the ends of contact obstacles because I wanted her to be successful and I wanted some chance of keeping up with her. This was time well spent because she made it from novice through her MACH title without ever being called for a missed contact! 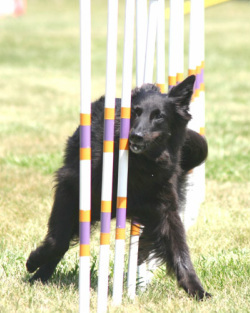 We competed in our first agility trial in Utah in 2000 when Katie was 1 1/2 years old. She flew through the courses with Jen crying in the background as Katie soared over the jumps and gobbled up the yards. Four months later, Katie had earned her novice and open titles and started competing on the excellent level courses where we hit a brick wall as so many agility competitors do with their first fast dog. I had a very steep learning curve to master running such a fast dog. I couldn’t match her speed and neither of us had the skills to master courses at a distance. I never knew how little I knew about agility until I met Katie. As for getting a good instructor, well I was one of the four instructors teaching here in Boise. I went to seminars and I studied the FCI World Championship tapes to see how the top handlers ran their dogs. I studied Guy Blancke’s runs and emulated his style. I strove for smoothness in handling and was often complimented on our style. In 2001, Katie convinced me that she had great potential, but she couldn’t utilize her full potential with us living on a hill. She clearly needed access to flat ground on which to hone her agility skills. And I was turning 50 with the mid-life crisis looming. I was driven to consider how I wanted to spend the rest of my life. Katie won out and we went shopping for a one-acre place on which I could train Katie and train others to be successful in agility competition. And that is how Dogs A’ Flying got started. It has been a wonderful experience and I have greatly enjoyed helping others develop their agility skills, to help them dance with their dog and master the course. But even more rewarding than that is seeing people and their dogs develop stronger bonds and commitment to each other. 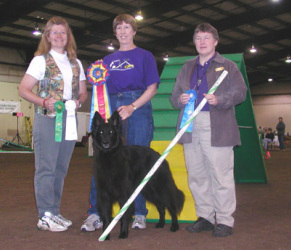 In May 2003, Jen notified me that Katie was nationally ranked the top Belgian Sheepdog in AKC agility. That was such a surprise as I had never even looked for such a ranking. 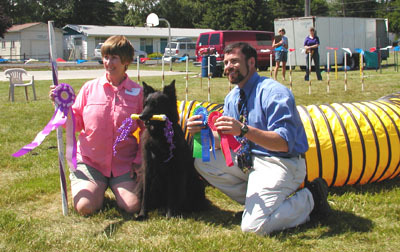 We finished the year as Top Dog and in 2004, Katie was the top Belgian Sheepdog for lifetime achievement in AKC agility.She also earned her Belgian Sheepdog Club of America’s Agility Hall of Fame in 2003. We also competed in AKC Nationals in 2003 and Katie finished the first day in the International-State Team Competition as the #1 24 inch dog. We didn't do so great in the Nationals competition due to my stress. On May 28, 2004, Katie earned her master agility championship (MACH) title in Eugene, Oregon. This coveted title requires competition at the Excellent B level earning 750 speed points and 20 days ofqualifying on both the standard and jumpers runs. 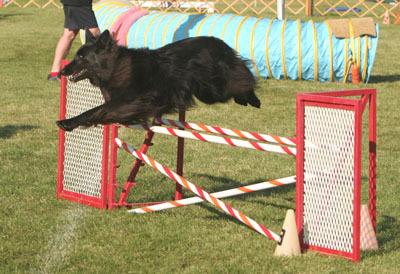 At that time, only seven Belgian Sheepdogs had earned MACH titles. Katie earned the title in style with first and fourth place runs that day. It was a wonderful day because we had many friends competing and they shared in celebrating the accomplishment. Earning your first MACH title takes years of work and I will always remember everything about that day, the glee on Katie’s face as we completed our last qualifying run, our victory lap, the many friends that celebrated, the beautiful MACH ribbon that Christie Bowers had ready with Katie’s and my names printed on it, and the great joy of having such a great agility partner. Katie's breeder, Jennifer McCandless, wrote a wonderful poem in tribute to Katie. Go to Katie's Poem. Then on July 3, 2005, Katie earned her MACH2 in Moscow Idaho. It’s funny how when you are just one step from reaching your goal, that little stuff keeps getting in the way. We trialed for months in search of the last double Q. On the day it happened, I knew the night before that it would be our day. And so it was. Addy Huston made Katie her own MACH bar which Katie proudly carried on her victory lap. But age was catching up with Katie. She had some structural issues that caused excess wear especially on a big, driven dog jumping 24 inches for years. Her times were great because she was so efficient. But it was time to move to the preferred classes. Katie also lost confidence on the dogwalk for some reason so we just entered jumpers classes. 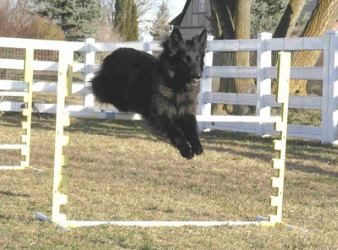 Then in October 2006, Katie got invited to the AKC’s first Agility Invitational as one of the top Belgian Sheepdogs in the country. So we went to work preparing. We hiked in the hills to get us both more fit. We went back to jumping 24 inches and brushed up on the contacts including the dratted dogwalk.We started competing in the regular classes rather than preferred classes. And Katie still refused the dogwalk in trials despite huge rewards for doing it at home. We drove from Idaho to Long Beach California for the Invitational in December 2006 with Karen Kessler as my much appreciated helper. We ran 4 times at the Invitational and finished as the Top Belgian Sheepdog! She did the dogwalk on both standard courses but I know she wasn’t wanting to take it. Her courage under fire is what made us successful. I willed her over and was right with her. And she rose to the cause. I was so proud of her. Although she was past her prime in agility, she gave it her all and it was our greatest success. She also finished 20th out of over 100 dogs in the 24 inch jump height at the Invitational. Katie mostly retired from agility in the spring of 2007. She did complete her NADAC Elite Tunnelers title in the spring of 2009. Her last agility run was in the spring of 2010. She competed in Elite Tunnelers and Weavers and Novice Hoopers. She qualified in Tunnelers at the elite level while competing as a proficient non-veteran dog. I was very pleased that she made time at the age of 11. On this last run, she broke her start line but I let her run, somehow knowing it would likely be the last one. Katie had epilepsy starting at age 7. She had been on phenobarbital since early 2007. The disease and the drugs are both cruel and impair quality of life. But she was still my great partner and friend. Katie was the creator of Dogs A’ Flying because she drove me to rise to her levels of skill and passion. Katie enriched my life in so many ways and taught me more than I ever thought a dog could teach a human. Agility was the foundation upon which Katie and I have become great partners. I loved the partnership that we established as we challenged the courses together. When I was very stressed at AKC Nationals, she was solid as a rock in her performance. What a joy to have such a partner. While my sport has been agility, no matter what the sport, the reward is the powerful bond that develops between dog and handler when you work and train together toward a goal. On about June 12, 2010, I noticed that Katie seemed to not be too interested in eating, and she wasn't as wild when she met me when I came home from work. Then she quit eating. On June 18, I said farewell to my beloved Katie. She had a large mass in her liver and the vet believed that she had hemangiosarcoma. Like all of you who have said goodbye, it was heart-wrenching. Before the vet gave the injections, Katie licked my face repeatedly. Nancy got kisses too. I told Katie how much I was going to miss her big ears. She laid her head in my hands as she drifted off. Katie was proud, loving, and beautiful even at the end when she was so sick. It was an honor and a privilege to share my life with such a spirit as Katie. Rosie went to the Rainbow Bridge on May 20, 2011. She was 16 years old and her body just gave out. Her mind, liver, kidneys, and heart were all strong but her muscles weren't. Rosie was an awesome dog that was such great help to the many fearful dogs that I have worked with. She showed them how likeable they were and that she would like to get to know them better. Katie's spirit came to get her. I am so sorry that Rosie wasn't here to see Nick. Rosie left me on my last day of work at the Idaho Transportation Department. She and Katie enriched my life then and now.